One of the classic applications that many engravers will be faced with is completing a plaque or sign that is significantly larger than the engraving area offered by their present equipment. Many computerized engraving systems offer software features that help in accomplishing this. Often referred to as long-plate or extend-a-plate, the software will guide the operator in the process of advancing the plate under the engraving spindle in increments that correspond to sections of the overall plate. 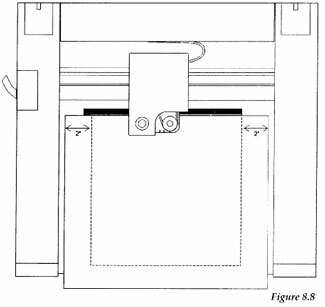 Here is a simple approach that can work for applications where the overall height of the plate is no greater than twice the size of the engraving table bed size. This method would be used if long-plate is not an option or not available in your system. Our example assumes an engraving table with a bed height of 12", something very common in many designs. Create a new job using the autolayout feature available in your software. Our plate size will be a 28" X 22" with 7 lines of text however; our actual layout specification will only be 24"x 22" (the table bed size in the X-axis). Many software programs automatically switch into the long-plate mode when a plate size greater than the bed size is entered. Our example assumes that you do not have this feature. Remember that even though the plate is 28" wide, the engraving will be confined to the 24" dimension. You may want to take the text closer to the edge of the plate by moving or adjusting the margins out closer to the 24" dimension. Add your text to the lines at the top of the plate starting with line 1. Stop adding text when you get to a baseline of 12". You can see in the example that we can only add text up to line #4. You cannot exceed the 12" cutting area in our example and any text below 12" cannot be cut in the first pass. Engrave this portion of the job. Mark the plate at 12" (by making a small line in pencil in the material) in the Y-axis so that the proper alignment can be made for the second half of the job. Remove the plate and turn it around 180 degrees. The plate is now upside down. Place the plate on the table as in step one by leaving a 2" over hang on each side (remember your left and right margins). Place the plate forward so that only the remaining area (the 10") not yet engraved is on the engraving table. You will need to align the 12" mark on the plate to the bottom edge of the table. Go back to the engraving layout and remove the text from the first 4 lines. Add the remaining text to lines 5, 6, & 7. Select the software feature that rotates the plate 1800 (the "Upside Down" position). The engraver will move the lower right-hand portion of the table to engrave the remaining lines upside down. You can now simply engrave the remaining lines with perfect alignment.